I’m a bit of a stickler for grammar and spelling. Yes, I could be called the Grammar Police, although I do try and keep my mouth shut if it’s on other blogs I’ve read. After I left university, I went for a job interview for a marketing exec job and they asked me to do a proof reading test. The interviewer was a bit surprised at how brutal I was and said she hadn’t been expecting anything quite so correct. It’s not like I’ve ever been taught grammar. When I was at school in the 80s and 90s they didn’t teach verbs or pronouns, sentence construction or similes like they do nowadays. My mum did buy an Usborne Detective Noun kids reference book which I absorbed for ages at around age 8. But I’ve just always been a bookworm. And had the importance of grammar and spelling instilled in me by my mum. N is learning all the grammar at school now, so I get to try and make sure his grammar is ok. His spelling is careless at the moment, but it’s not bad for his age considering his carelessness. We’ll work on that as he goes through the school. Others might say grammar and spelling isn’t important, but I don’t agree. And plenty of others are writing books on the topic – from Eats, Shoots and Leaves to newer books like Have you eaten Grandma? By Giles Brandreth. Text speak might be taking over with people used to reading without punctuation, but that doesn’t mean it’s not important. This fills me with horror. My 7 year old son was taught their, there and they’re last term and could explain the difference between the 3 (he probably can’t remember it now, but over his school years I’m sure he will). He certainly understands what an apostrophe means and other basic grammar rules. Yes some people are dyslexic and others have various other struggles with english language. But I think a lot of people are just lazy and have never bothered to remember what they were taught. Or have never read enough to work out the differences if they weren’t taught. Even if you struggle, there’s so many tips and hacks to help find the correct answer there’s not much excuse for not being able to find out the correct version of spellings. So much can be learnt from being a good reader which is why I’m so keen to encourage N to read more and enjoy it. Readers can understand straight away what you’re writing about. They don’t have to work it out. Correct grammar means clarity of meaning where missing punctuation could make a sentence mean 2 different things. With text speak, new dialects and languages which can have diferent interpretations, correct grammar and spelling is something standard which everyone should know and be able to read and understand. For school children, learning about grammar means they can easily translate their understanding into other languages they might learn. A good understanding of grammar will open up a variety of jobs that involve writing across never-ending businesses. It’s more professional. Especially in blogging, if you don’t have correct spelling, readers may think it’s sloppy and careless. Oh, and lazy for not using spelling or grammar checks that are available. It’s not a great impression to brands you might want to work with. Poor spelling and grammar could put people off reading your work. I don’t think we need to go to the extremes that the National Curriculum now does, especially for primary school. Who really needs to know all the technical names for grammatical rules? We lived without them as children, I learnt most of my grammatical understanding from learning french grammar. But I’m glad grammar is still seen as important and that we can all understand what people are saying when they use it. N enjoys learning grammar – he’s a boy who likes black or white answers, logic. So grammar fits the way his brain works. I’ll be sharing my love of grammar with him. People say that grammar is outdated. But without basic grammar and correct spelling, how do we know what rules can be broken. Because they will be. Just looking at the preferred way of writing for the internet vs print. I’m hoping that people still take care with spelling and grammar into the future. Even though less people are needing to write with the increase in podcasts and messaging. How do you feel about grammar and spelling? Are you more relaxed about it, or are you like me and cringe with every typo you see? Is homework for primary age children a good thing? Their, there, and they’re + your and you’re, these two are the most annoying ones for me. Also, people not using Oxford comma. 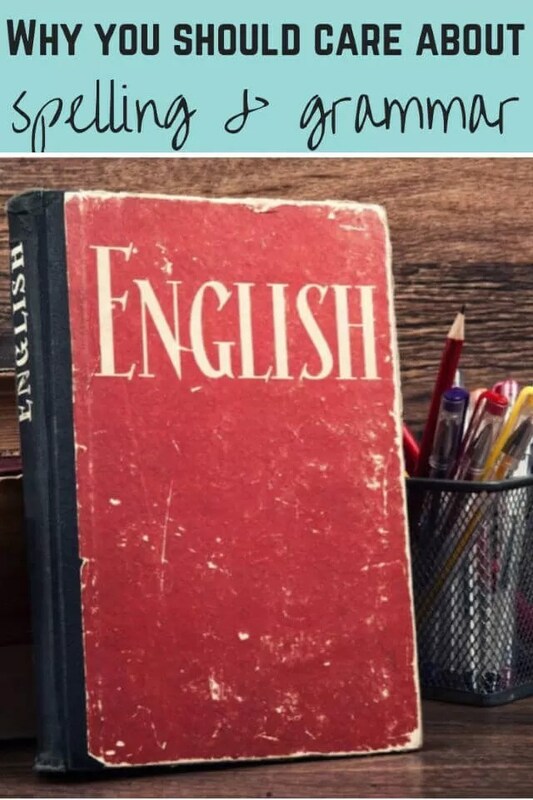 I’m particularly annoyed because English is not my first language and, despite learning in school and using it for years, I’m still learning. Thus, is somebody wrote something in a different manner than I would have done, I will search online to see if I’m making a mistake. Imagine my frustration when I realise it’s not me. Proficiency in the native language is a must. Ah yes, the Oxford comma. We don’t really get taught proper grammar at school (or not when I was there anyway), my mum drummed mine into me if I wasn’t sure. The Oxford comma looks like it’s on its way out, although I think it should stay. Saves a lot of confusion if you use it! I am with you on this one. Don’t get me started on stationary and stationery!! I can’t believe how many people I’ve seen working with brands on stationery products, and so many get it wrong. Mortified! Ah, glad to hear it’s not just me. I can’t read blogs with typos and poor format and construction. It just makes my head hurt trying to work out what they’re saying.